Karl Ferdinand Herzfeld was Emeritus Professor of Physics at Catholic University of America (1936-1978). Other institutional affiliations included Johns Hopkins University and the University of Munich. His research interests included theoretical physics and physical chemistry. February 24, 1892Birth, Vienna (Austria). 1910 – 1912Studied physics and chemistry, University of Vienna, Vienna (Austria). 1912 – 1913Studied physics, University of Zurich, Zurich (Switzerland). 1912 – 1913Studied physics, Eidgenössische Technische Hochschule, Zurich, Zurich (Switzerland). 1913Studied physics, University of Göttingen, Göttingen (Germany). 1914Obtained PhD in Physics, University of Vienna, Vienna (Austria). 1914 – 1918Officer, Austro-Hungarian Army. 1920 – 1923Privatdozent, University of Munich. 1923 – 1926Extraordinary Professor of Theoretical Physics, University of Munich. 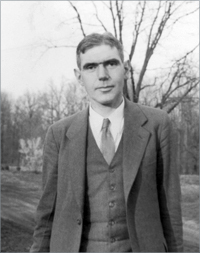 1926 – 1936Speyer Visiting Professor (1926) and Professor of Physics (1926-1936), Johns Hopkins University, Baltimore (Md.). 1930 – 1931Lecturer, Cooper Union and Fordham University. 1936 – 1978Professor of Physics (1936-1968); Chair, Department of Physics (1936-1961); and Emeritus Professor of Physics (1968-1978) Catholic University of America, Washington (D.C.). 1941 – 1945Scientist, National Defense Research Committee, United States Navy. 1948Visiting Professor, University of Munich. 1951 – 1972Member, Mine Advisory Committee, National Research Council. 1958Visiting Professor, University of Munich. June 3, 1978Death, Washington (D.C.). Advised by Herzfeld at Catholic University of America, "Influence of the Form of the Wave Function on the Energy Value." Advised by Herzfeld at Catholic University of America. Advised by Herzfeld at University of Munich, "Zwei Beiträge zur Theorie konzentrierter Lösungen." Advised by Herzfeld at Johns Hopkins University. Professor of Physics; Chair, Department of Physics; and Emeritus Professor of Physics. Speyer Visiting Professor and Professor of Physics. Scientist, National Defense Research Committee. Privatdozent; Extraordinary Professor of Theoretical Physics; and Visiting Professor. Studied physics and chemistry; Obtained PhD (Physics) in 1914. An illustrated history of the Herzfeld family, 1972. Karl Herzfeld papers, 1886-1974 (bulk 1948-1967). The American Catholic History Research Center and University Archives. History of the Search for Gravitational Waves [sound recording], 2017 January 30. Kinetische Theorie der Wärme / von Karl F. Herzfeld. Karl Herzfeld Physics Today obituary.